Have you ever had a life-changing moment? I had one of those “moments” a few weeks ago. A moment that has completely changed my life forever. For those of you that do not know yet, I quit my job in pursuit of becoming a successful entrepreneur. This has been a burning desire my entire life and for some reason, I always thought it was too risky. I have now been self-employed for almost a month and I want to tell you all about it! Since graduating college I have had some pretty awesome jobs along the way. Two of my favorites were UPS Delivery Driver and Jail Deputy. Both these career positions came with great pay and benefits. I can honestly say for a majority of the time I was very happy working those jobs. With that being said there was always something that did not feel right. I was always scared as hell to think about the future and picture myself at the same job for the next 30-40 years. No thank you! 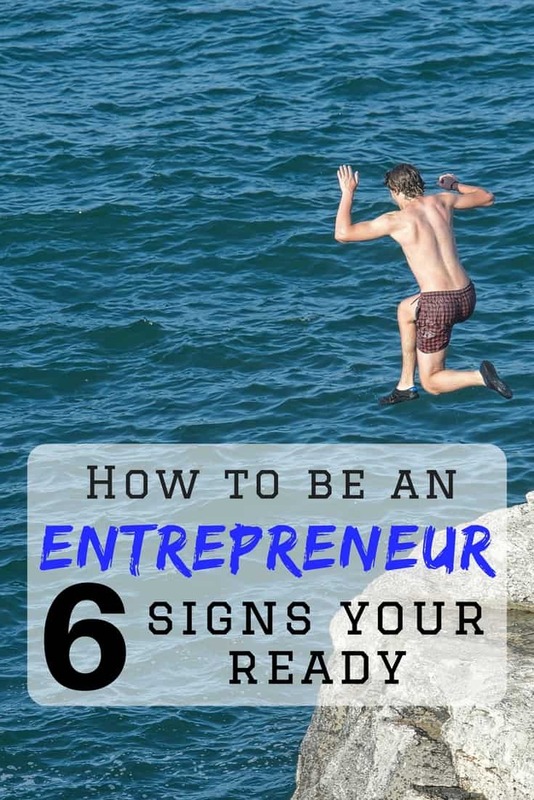 Below I am going to go through the 6 signs I went through that finally pushed me to become an entrepreneur. This article is by no means trying telling you to go to work and quit tomorrow. I want to help those that have been juggling with the idea and help provide some clarity. Making the decision to become an entrepreneur is not something to take lightly. 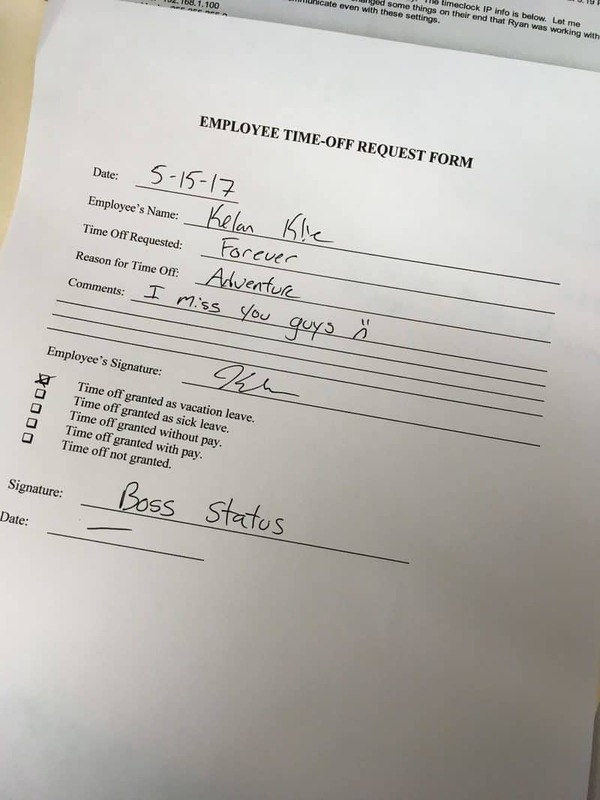 Here is my final “time off request” form I submitted after I told my boss I was done. Luckily he had a great sense of humor! For me, this happened at every single job I had, which has been quite a few. As weird as it sounds every job felt like I was stuck under a rock. I was passionate about work at first, but it would quickly fizzle out. Waking up every morning to go to work would become unbearable. I would continue just be punching in and punching out, waiting for the weekend. That’s no way to live! Even if you are great at your job and not getting fulfilled is going to cause problems. There were two very distinct signs that happened when I knew it was time to become an entrepreneur. The first was not being happy after landing my “dream job” in law enforcement. My entire life I wanted to work in law enforcement. About a year and a half after working as a Jail Deputy I knew law enforcement was not for me. I even turned down a job as a road patrol officer, the hardest decision of my life! The second was when I was an office manager. Even though I was working for one of my best friends, I was still not happy. We had a blast working together and got extremely close. However, it hit me, if I can’t be happy working for one of my best friends will I ever be happy working for someone else? I remember getting to a point at every job where I would say, “There is no way I can do this the rest of my life”. If you are scared to think about the future and not excited about the endless opportunities, it might be time to reconsider what you are doing. Don’t get me wrong work is great and it’s a must to be a member of society. However, we live such a short life, why waste half of it working at a job you can’t stand? Think about this for a second. The average person works over 90,000 hours over their entire life. That is A LOT of time to be doing something you don’t truly enjoy. Do you have a deep passion you are constantly trying to turn into a business? For me, it was home inspections, house flipping, landscaping, and running an e-commerce business. I was constantly thinking how I could start a business and how I would build it up to replace my income. In high school, I remember vividly my parents telling me to “get a job”. Instead of looking for a job I started selling anything I could get my hands-on through eBay and Amazon. This started my first legit online e-commerce business at the age of 15. This business supported me throughout my entire college career. Check out my interview with the CEO of one of the biggest drop shipping companies around. If you are constantly thinking about starting your own business it might be time to become an entrepreneur. 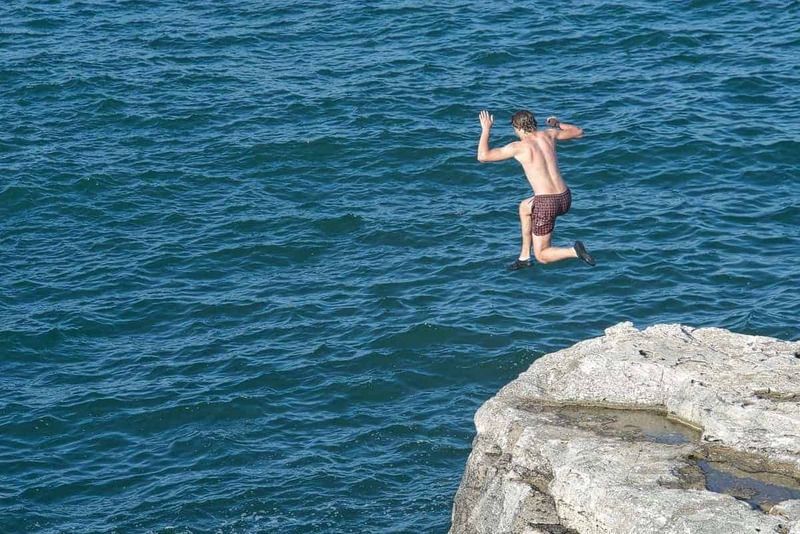 Making the jump to become an entrepreneur is scary! The first day I woke up and did not have to go to “work” was one of the scariest days of my life. My entire income was now in my own hands and nothing was guaranteed. I ended up working around 16 hours my first day just of our fear (and not having any systems in place). If you plan on becoming an entrepreneur you need a great support system. This includes family, friends, money, time, and patience. Brittany has always been incredible at supporting me with every decision I make in life (besides the motorcycle, that’s another article haha). We have always been very frugal, so saving money comes second nature to us. We have saved up enough money to live comfortably for the next 9-12 months without me having to make anything. Another financial decision we have always made is trying to live off one salary, it’s an amazing life hack! I would never recommend starting your own business without taking the proper financial steps first. Having a good support system will have huge impacts on the likelihood of success. Knowing yourself inside and out before becoming an entrepreneur is critical. Find what drives you each and every day. For me, it has always been freedom. The freedom to spend time with my family and work the hours I choose to work. The freedom to make my own decisions about my own business. I can tell you firsthand after working for myself over the last month that the freedom is unreal! Questions to ask yourself: What do you want your legacy to be? Who are the people you want to help? How many hours are you willing to work upfront? Are you disciplined enough to not have a boss telling you what to do? Do you truly believe in what you are doing? Answering questions like these will help you get a bigger picture of your life, helping you determine if it’s time to become an entrepreneur. Two awesome books I highly recommend reading are Strengths Finder 2.0 and Expert Secrets. They are both fairly recent books and they are incredible for entrepreneurs just starting out. Do you fully believe in your dreams? Can you visualize what your life will be like 5-10 years down the road? Do you know you can “make it”? For me, my confidence comes from my life experiences. Starting my own online business when I was 15 was huge in developing my confidence to follow my dreams. And I’ll be honest after working as a Jail Deputy for over two years I feel I can do ANY job out there. I think having a backup plan also provides a good amount of confidence. While starting our blog I was also working full-time and going to school at night to become a certified home inspector. I now have my NYS license to be a home inspector. It’s always a good idea to have a backup plan! By no means have we “made it” on our site, not even close! We are just starting to routinely make affiliate sales, get sponsored posts, and earn income via ads. However, I am more than confident we can turn this site into a full-time income. To supplement my income while our blog is growing, I have found some freelancing gigs such as website testing, digital marketing, and flipping items on eBay. Gary V says, “you have one life”. A life that is completely up to you on how you use it. For me, I was sick of jumping around from job to job chasing happiness that was never going to come working for someone else. I needed my freedom and now that I have it I will never give it back! If you have a job that you love, congrats I am happy for you! Being an entrepreneur is not going to be for everyone. The ball is completely in your court at all times, the stress is high, work never stops, and there is no option to give up (a good motivator). If you find yourself complaining about your job or life stop sitting back and start doing something about it! Put in the work and get a plan in place. Don’t wait for tomorrow or the next week, start today! Feel free to join our free Facebook group! What business have you wanted to start? Great post and nice to hear the story behind your move! Thanks for sharing your story! It is not easy sticking with a job you don’t like. I’m glad you took the plunge into full-time blogging. Wishing you guys success! Thanks Ms. Frugal Asian! It’s been an amazing journey so far. Can’t wait to see where it takes us. Your story resonates! I’ve been a lifelong entrepreneur with a few lapses along the way when my companies were bought by bigger businesses. Each time that happened, I discovered the painful reality that the politics and other silly behavior inside the big company were just eating me up. I’m a creative type–I just want to get on with delivering something of value to my customers, something they’ll love and appreciate that. Most jobs don’t let you do that very well. I also love talking to entrepreneurs and started my own blog to help others learn how to succeed. Congrats on this blog, it’s very helpful! Thanks! Life’s journey is such a blessing. So grateful to be in the position I am in today. Hoping this can help bring some clarity to others. Great post – and congratulations on finding your freedom! My move into freelancing is what I see as my first step into becoming an entrepreneur. I had that same feeling of lack of freedom and excitement in my 9-5 jobs – I knew I wanted to make my own decisions for my life. Entrepreneurial life takes a lot of motivation and determination like you said, but I am totally with you – never, ever handing my freedom back! Great post, and I can totally relate to some of those feelings! I quit my corporate job back in January with no real backup plan, other than I wanted something more. Since then, I’ve decided to give blogging a try (this is the main subject of my blog). I’m more motivated with my blog than I ever was working in a high paying corporate job. Talking to most of my former co-workers made me realize that most people are unsatisfied in their jobs, but are apprehensive to leave because of fear of the unknown. Let’s keep fighting the good fight and showing people that pursuing your goals isn’t so scary after all! Awesome to hear! We will keep doing our part. Life is too short to not pursue your passions. Tick to all 6 signs for me. I love what I do (marketing) but it has been less fulfilling even though I have finally landed what I thought would be the dream job in the corporate world. As the sole income earner (husband is SAHD) I can’t make the leap yet to being a full time entrepreneur but I hope to do so soon. Since starting my blog and learning all about the world of online business I realise how many skills I have that already put me so far ahead in terms of growing my blog and now looking to land some freelancing gigs. That’s awesome to hear. Keep chugging away and the opportunity will come knocking. I loved reading your story and I hope I get to do what you were able to do. Patience is key. Very true! Keep pushing and it will happen. Congratulations! As a serial entrepreneur I can totally relate. Having a support system and believing in myself have always been my mantra! I’m in higher ed career services and from my professional experience you really hit the nail on the head. The one I like to focus on a lot with students is knowing what is important to you in life. Sometimes that is harder for people to articulate than they think and having that really honest conversation with yourself is so critical to success. Best of luck to you! Thanks Becca! Honestly, it was something I struggled with big time. I went through an identity loss after leaving law enforcement. I can honestly say I have never been happier. I would love to eventually go to high schools and help kids find their purpose. I use to take those “career path” exams and force myself to answer so I got what I wanted hahaha. I really love this and it is so true. You’re right on needing to go and create the thing that fulfills you when the current job is just not doing it. Good luck on the journey. I love my small-business even when it gives me headaches. Thanks! One month in and all signs are pointing up. Life has ALOT of freedom when you are working for yourself. Excellent post, definitely making me want to try harder with all of this, thank you! Anytime Sam! Thanks for stopping by. I just fell I need a few more passive income to risk and start my own business. I can take the risk of starting my own thing, but I also fell I need to have some financial income to pay my bills. It is tough though as number #3 is really dominating my thoughts ! So yes the blog was the job I jumped to full-time after leaving my job. Our blog only made around $50 at that time. Pretty scary but we had a nice nest egg to allow me to make the jump. Within a week I found a part time digital marketing job on UpWork where I am making more than I was at my previous day job. I also just started working part time for VIPKID. It’s an incredible side hustle if you are venturing out starting your own business. Feel free to send over an email with any questions you might have.